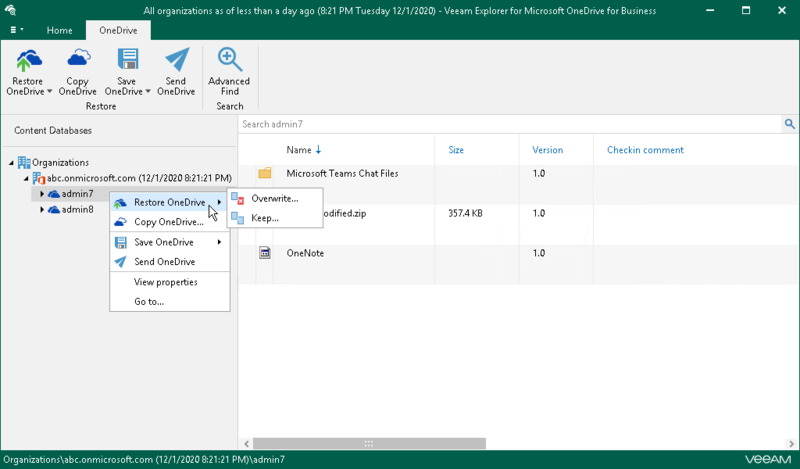 Veeam Explorer for Microsoft OneDrive for Business allows you to restore users OneDrives or certain documents and/or folders of the selected OneDrive. To use an internet proxy server to restore backups, make sure to provide appropriate proxy server address and the port number. For that, go to the Control Panel > Internet Options Connections tab, click LAN Settings, select the Use a proxy server for your LAN checkbox and specify a proxy server you want to use. Credentials for such a proxy (if needed) will be taken from the Control Panel > Credential Manager > Windows Credentials console. On the ribbon menu or using the corresponding context menu command, click Restore OneDrive or Restore Document/Folder when restoring documents/folders and Restore OneDrives when restoring OneDrives of the selected organization or group. Overwrite — to completely overwrite existing OneDrive data. Keep — to preserve existing data and recover items with the RESTORED prefix (RESTORED-<file_name>.ext). 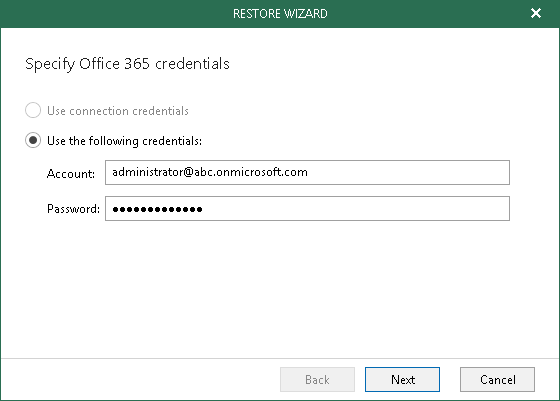 Specify Office 365 credentials to access the target server and click Restore.